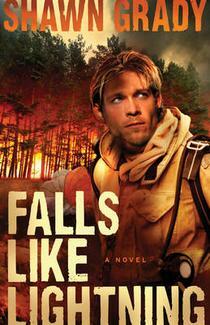 Smokejumper Silas Kent never expected to see pilot Elle Westmore again. In fact, reuniting makes him realize what a mistake he made all those years ago. But before he has a chance to try to make amends, he's called to lead a new crew into battle against a massive fire in the Sierra Nevada’s. And then things go very wrong, very quickly. A suspicious engine explosion forces the crew to parachute early while Elle barely survives a crash landing. Silas reaches the ground safely, but in beginning a desperate race to reach the downed plane, he soon realizes he has more to fear than just a raging forest fire. I liked the sound of this book and I often really enjoy fiction books written by men. It’s a fresh perspective. I’ve never read Shawn before, so I was keen to see what he had to offer. I really enjoyed this trill a minute ride. From beginning to end I was enthralled. The action, adventure and romance held me captive. I told my husband he would like this book. It’s still at heart a boy’s book but can appeal to all people who like to read a fast paced well-written novel. Can’t wait to read more from him. Final note: The guy on the cover actually looks the like the Silas described in the book – a first! I read his first book and really loved it. Jess I am sure you would like his first book too. It is fast paced also.